Setting up a website is an essential part of any successful event. It will help to create buzz and generate attendance. By choosing the right events WordPress theme you’ll be able to promote your event online and create a resource that makes it easy for your target audience to see why they should register for your event. WordPress events themes are designed to be used for any type of events. You can use it for conferences, concerts, exhibitions, conventions, ceremonies, parties, sport events, congresses, startup events, workshops, classes or absolutely any type of events you like. All of the themes below provide extensive features that will suit any event manager’s needs and goals. Features like countdown widgets, event planners, and one-page designs are just a few of the features that planners will find in these event themes. A good events theme will also make it easy to publish useful information for your attendees, such as the event location, session schedules, speaker profiles and other details vital to the event itself. It is worth mentioning that the best themes also have registration forms on their websites to capture the contact information of each visitor. Depending on your preferences, you can either sell tickets yourself or integrate with a leading third party ticketing service to sell tickets, add event calendars, live chat support, and more. It goes without saying that SEO-friendliness and responsiveness are some other key features which describe the themes listed in the collection below. Expand your event organization to an entirely new level of awesome! By choosing one of the items in this collection you’ll be able to create a website that builds anticipation and excitement for the big day. Check out our collection of 5 Best full responsive premium Events WordPress Themes in 2015. Landing theme can help you design an effective landing page to increase your site conversion. It comes with drag & drop Builder which includes all the tools you’ll ever need to make beautiful landing pages. Each page can have different header design by choosing from various header design options. To make it easier for you, the theme also includes 10 beautiful layouts which you can easily import to your site. Set-up a landing page in minutes by importing from 10 pre-built beautiful layouts. Made for Agencies, App’s, Events, Ebook, Product, Weddings, Products, Shops, Marketers, your own Personal page, or even one simple Fullscreen design. Simply import the layouts and edit the text & images, and you’re done! With the Pre-designed layouts designing a landing page becomes fast and easy! 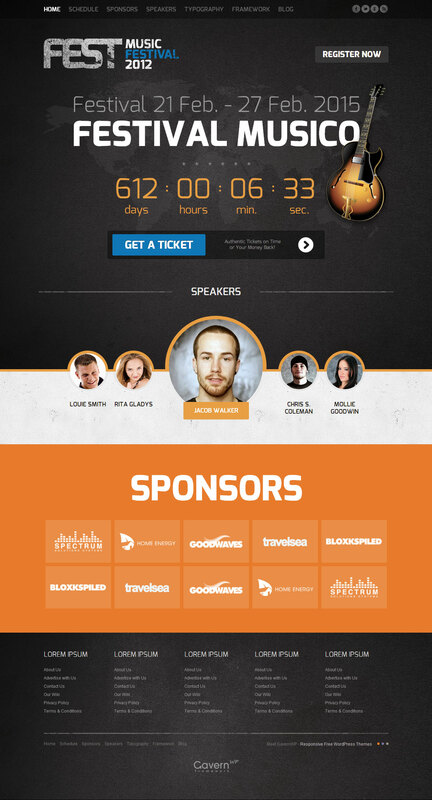 Fest is outstanding WordPress Responsive Theme for Event. Planning a unique conference, festival or other event? Announce it using the latest event theme for WordPress. This outstanding theme will help you present all of your event information in a clear manner, and ensure your website remains attractive! Fest is based on a powerful GavernWP Framework, one of the best, intuitive and customizable framework for WordPress themes. Also, thanks to WPML support, creating and running a multilingual sites is easier as never before! Wedding Day is a Premium WordPress Responsive Theme intended to highlight your most memorable moments in a stylish way. Wedding Day comes with a full-width responsive design, smooth transition effects and sliders, a beautiful photo album, dedicated pages for your wedding ceremony, date & place, RSPV form and a stylish blog. 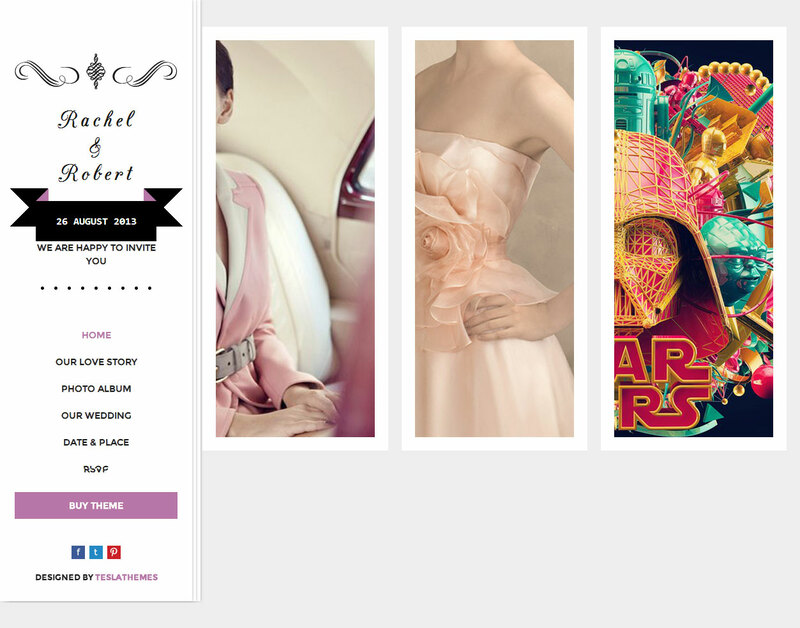 Theme is best for Wedding ceremony, fashion blog, photography website, event related website and more. Wedding Day theme has everything you need to make your wedding ceremony special. We’ve packed Wedding Day with our latest features like full-width responsive design, built-in shortcodes, social media integration, filterable photo album, customizable countdown, AJAX forms, Google Maps and much more. Make your wedding ceremony a memorable event with Wedding Day WordPress Theme. Wedding Day is powered by Tesla Framework, a powerful administration tool that comprises all our great features and allows you to easily customize the look and functionality of your theme, without advanced knowledge of programming. Cool Stuff is WordPress Responsive Theme with minimalist, modern, flat design. It comprises our latest features and a powerful framework to help you personalize and expose your content in a cool way. Theme is best for blog, magazine, band, music related website, events website or any other related project. Its powerful customization possibilities make it the best choice for you. The template comes with a rich set of advanced features like: custom widgets, post format support, custom posts, built-in shortcodes, beautiful image slider with awesome transition effects, filterable and animated portfolio, Tesla Framework and much more. Grace is an elegant, premium WordPress theme built for churches and religious communities. With its rich features and flexible options, Grace is a theme designed with your spiritual needs in mind. 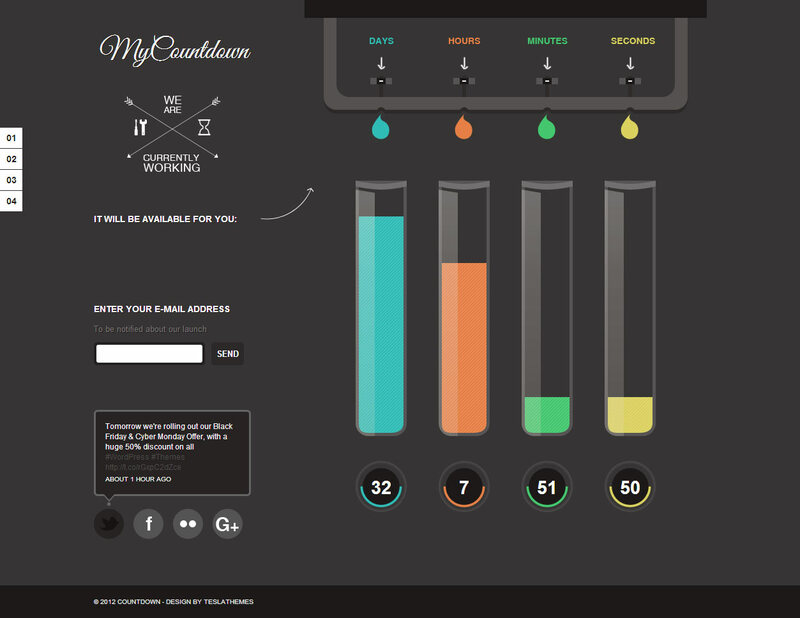 MyCountdown is a Coming Soon WordPress Theme with responsive design and awesome functionality. If your site is under construction and you want to let your visitors know about your launching in advance, this template if definitely for you. A “not found” page is not the best representation of a coming soon website, so we’ve created some cool features to help you leave a positive impression and keep your visitors up to date with your progress. For that, we’ve introduced a beautiful customizable jQuery countdown, newsletter sign up, AJAX contact form and amazing HTML5 and CSS3 effects and more. MyCountdown is best for coming soon website, under construction website, landing page, event website, or anything related. Use MyCountdown to attract visitors’ attention and announce about an event in a cool manner.